Our vision for Nairobi. We would be very happy for it to be included in the submission. Currently, the development vision presented (Nairobi 2030) is not one that takes into account what it means and feels like to live in a city. It is not one that addresses LIVABILITY. It is therefore not one that reflects the residents of the city rather only the government of the city. Thus it cannot adequately address one of the needs of the Master Plan: to enhance the quality of life of inhabitants of the city. … It should be thought of through the livability of the majority of its inhabitants – what can make their experience of the city wonderful, equitable, inspiring, sustainable, productive and unique? UNIQUE NAIROBI: This should be added as a category within each development vision. ECONOMY: unique economic features Nairobi has produced, go from jua kali enterprises to the new dot.com, digital media hubs. 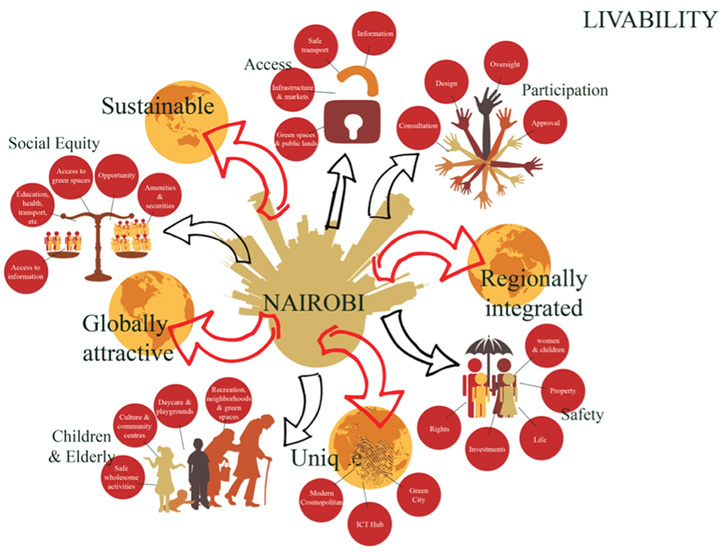 What economic things make Nairobi unique and can be promoted and enhanced? ENVIRONMENT: …The original green city was one that no matter which road you looked down you could always see a tree. Trees were planted along all sidewalks and all buildings. It had many public green spaces, including the roundabouts (running down the middle of the city) originally planted with unique flora, but now dug up in the name of ‘beautification.’ These are unique features of Nairobi. Another feature is the many rivers that run through it. The city itself is named after water. How are we building on this legacy? These are excellent thoughts! We must follow up to ensure that the planners do take note of them. Let me know if there is anything I can do to help!